The many benefits of physical therapy include helping you regain function after injury or illness. A physical therapist will assess your mobility, balance and strength before creating your physical therapy treatment plan. If you have injured yourself—be it a sprained or strained muscle, a torn ligament, or a broken bone—or if you have a physical condition that affects your joint flexibility and mobility, you may be tempted to take to your bed in order to alleviate your discomfort and recover your strength. But while rest is sometimes advisable, it can put you at risk for loss of function, muscle stiffness and blood clots. Physical therapy may be a better option when it comes to relieving pain, helping you regain your fitness, and preventing disability. And that’s not all when it comes to the benefits of physical therapy, for example, it can help rehabilitate you after a serious event such as a heart attack or a stroke, prevent you from needing surgery, and help you learn to use assistive devices such as canes, crutches or walkers, and prosthetic limbs. Another one of the benefits of physical therapy is that it can restore your sense of emotional well-being. What Is Involved in Physical Therapy? A physical therapist will assess your mobility, balance and strength before creating your physical therapy treatment plan. Depending on your individual needs, your regimen may involve simple stretches and range-of-motion exercises. You may not actually have to do these exercises yourself—for example, after knee replacement surgery you may use a continuous passive-motion machine, which takes your knee through a range of motion automatically, without you having to use your muscles. Another physical therapy approach is massage, which can be utilized to help alleviate a muscle spasm, or manipulate a joint. Heat packs and cold packs also may be used. Cold packs can reduce swelling in an injured or arthritic joint, while heat promotes blood circulation, which may aid the body’s healing process prior to engaging in strength and flexibility exercises. Ultrasound may be used during heat treatment—as well as its use as an imaging technique, it can deliver heat to the deeper tissues of the body. Water therapy is an approach that can be particularly beneficial when it comes to arthritis in the large joints of the body. Warm water provides buoyancy, supporting your weight and alleviating stress on arthritic joints while you work on their flexibility and strength. Other “props” that may be used during physical therapy include weights, resistance bands, balance balls, and medicine balls. Neurological therapy: This can be used to help people who have suffered a stroke or spinal cord injury, as well as people with dementia or other neurological conditions like Parkinson’s disease and multiple sclerosis. Vestibular therapy: This is used to help people whose inner ear—which plays a vital role in your balance and coordination—has been damaged. Physical therapy can help your brain adapt and compensate, as well as help you achieve a posture that is less likely to result in you losing your balance and educate you about safety. Hand therapy: A physical therapist who specializes in hand therapy can work with you if you have repetitive stress injuries to your hand, carpal tunnel syndrome, or rheumatoid arthritis or osteoarthritis. They also can help you learn to compensate for nerve damage in your hands, amputation of fingers, and using your hands if they have been injured or severely burned. Amputation rehabilitation: A physical therapist can show you how to care for your affected limb, train you in how to walk using assistive devices, and aid you as you become accustomed to wearing and using a prosthetic limb. Cardiopulmonary therapy: People who have suffered a heart attack, have heart disease or heart failure, or have undergone heart surgery can benefit from this type of physical therapy, which will help you learn to take sufficient exercise without exhausting yourself or causing your heart rate to increase above a safe level. 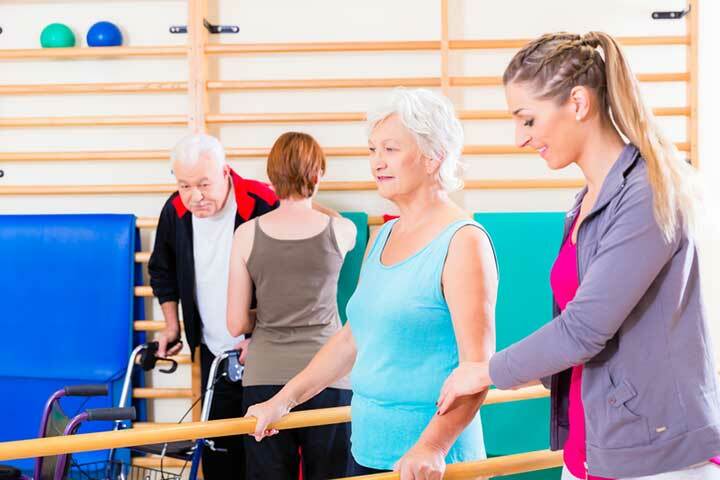 Geriatric physical therapy: This is very helpful to seniors who may be dealing with age-related physical decline, and aches and pains due to wear and tear on their joints. Fall prevention is a major part of geriatric physical therapy, and your therapist also may train you in how to fall safely if you should trip or lose your balance. Lymphedema rehabilitation: Lymphedema is swelling that typically affects the arms or legs if the lymphatic system is damaged and lymphatic fluid is unable to drain. It’s common for women who have their lymph nodes removed during mastectomy to suffer from lymphedema. A physical therapist specializing in lymphedema rehabilitation can help people with the condition learn to alleviate the swelling. Osteoporosis rehabilitation: If you are at risk for the bone-thinning disease osteoporosis, a physical therapist can create a weight-bearing exercise program that will help you maintain your bone density. a heart attack, aches and pains, arthritic, arthritis, benefits of physical therapy, blood clots, bone, bone density, bone thinning, brain, cardiopulmonary, dementia, exercise, exercise program, fall prevention, fitness, heart attack, heart disease, heart failure, heart surgery, inner ear, knee replacement, knee replacement surgery, lymphedema, massage, mastectomy, mobility, multiple sclerosis, muscle, muscle stiffness, osteoarthritis, osteoporosis, pain, pains, parkinson s disease, posture, rheumatoid, rheumatoid arthritis, spinal cord injury, strength, stress, stroke.